There’s certainly no shortage of motivation and inspiration around us. From Gatorade and Nike commercials that will motivate just about any sedentary individual to workout, to Pinterest inspirational quotes that everyone likes to share. TV, magazines, social media and blogs all manage to create some kind of inspiration for the consumer or reader. Whether it’s a way of marketing, or simply a way to get readership–the choices are endless. Given the overwhelming outlets available, you would think we would be a bunch of impeccably disciplined creatures, tackling the day with incredible efficiency and motivation. No matter how many ‘likes’ we hit on instagram, motivation doesn’t happen via osmosis. We are still human and it takes an inner motivation to really get going. Whether you’re training for a marathon or trying to get more disciplined about your nutrition, attaching an emotionally compelling reason to the event will increase the chances of you following through. Once that’s accomplished, nobody said it better than Nike; you just have to do it! Yet, there is still an important factor to make sure things happen on a consistent basis. You must learn how to develop habits in your life. And the best way to do this is via learning how to establish micro habits. Scientists have come up with many ways that unhealthy habits can be broken, yet they’ve also encountered the notion that no single recipe fits all. One particular method in creating new positive habits that works incredibly well is developing micro habits. According to Stanford professor, Dr. B.J. Fogg, who’s been studying human behavior for over 20 years, taking baby steps (or what he refers to as tiny habits) and being aware of your environment can significantly impact anyone’s ability to change behaviors. Micro habits have been one of the most impactful practices that I’ve used with clients over the years. It’s a simple, yet overlooked method to adjust your daily patterns and behaviors. What is a micro habit? Any action that you do on a daily basis that takes less than 30 seconds to accomplish. Usually this action is related to something you want to improve in your life–such as exercise, nutrition, relationship, finance, etc. Why is this important? The current habits you have now basically create a pattern in your day. Healthy patterns = healthier living. Unhealthy patterns= unhealthier living. Pretty straightforward. Micro habits help you develop new habits and if done right can lead to a much healthier life. How to develop micro habits? Pick two micro habits you’d like to tackle. Right now, I’m doing the carrots micro habit where I eat two mini carrots as soon as I get home (I’m trying to eat more veggies). Also, I do 20 pushups as my physical micro habit. I do this right before jumping in the shower. Attach your habit to a current habit you do daily. This is key if you want to establish new habits, you’ll have to anchor them right after current habits (brushing your teeth, showering, eating). I eat my carrots right after I hang my car keys on the key hook when I get home. We’re trying to create automaticity and develop habits that occur almost subconsciously. Def: Automaticity is the ability to do things without occupying the mind with the low level details that are required; this is usually the result of learning, repetition, and practice. Once you have the micro habit set in place (2-3 weeks), then you can look to expand ever so slightly. Crucial point: Every time you complete a micro habit, be sure to embrace it as a victory! In a society addicted to only major accomplishments, this is an important step in developing habits. Do the fist pump, give yourself a “congrats” or start your own “don’t break the chain” challenge. The “don’t break the chain” idea was created by comedian Jerry Seinfeld in order to avoid procrastination. The concept is simple; spend some amount of time doing a desired activity every day and, when you do, cross off that day on a calendar. This creates a visual chain of X’s showing your progress. If you don’t do your specified task on one day, you don’t get an X and that chain is broken. When I develop challenges for my clients, sometimes I allow a certain amount of ‘off days’ (ie: if they omit sugar from their diet for 80% of the month, they have six ‘off days’ or ‘free days’ where they are allowed to indulge in a treat). The chain can thus be extended with a blank, or “—”, meaning the chain has not been broken. It seems almost too simple to work, but it’s allowed myself and my clients to accomplish so much. It’s small, but when consistency becomes part of your habit, there’s a ripple effect and that’s where you’ll see the changes happening. Don’t discount it just because it’s a tiny thing….10 pushups daily = 300 pushups for the month. 300 pushups will cause your body to change…aka get stronger! The final thing I want to highlight is your environment. Design an environment that helps you to achieve your habits. If you’re trying to clean up your diet, get rid of junk food in the house. If you really crave it, make yourself leave the house to go fetch it. Nine times out of ten you won’t. Also, preparing cut up veggies and fruit in the fridge decreases the steps required for you to eat them. If you want to start running more consistently first thing in the morning, try the micro habit of putting your running shoes right by your bed and wear your running gear to bed. Again, the more you can get rid of excess steps, the more likely you’ll be able to adapt the habit long term. I have a friend who was studying for the MCAT to get into medical school. He was really struggling, so he decided to put all the formulas he needed to know and as many facts as possible in several mini poster boards around his bedroom, all the mirrors around the house and even in the bathroom. This created an environment for success, and eventually he memorized even the locations where the facts were found. Today, he’s a successful Doctor. Whether you’re trying to get your mojo back with your workouts or trying to get ready for med school, developing micro habits can be a simple way to do it. The best part is that you can start today. I challenge you to identify two habits you’d like to improve upon, and make sure they are emotionally compelling. Break down a smaller micro habit from the main habit and think of where you’d like to anchor it (remember to attach it to a current habit) so you make sure you can do it everyday. Design an environment that can act as a catalyst in the development of your habit. Finally, be sure to cherish every accomplishment of a micro habit as a major victory. Like compound interest, you may not see the results right away, but if you’re diligent and consistent, you’ll reap the fruit of your labor before you know it! Positive habits are powerful. When plugged into our daily life, they can improve our health, relationships, emotional well being, work satisfaction and overall outlook on life. Take it one step at a time and don’t ever give up! 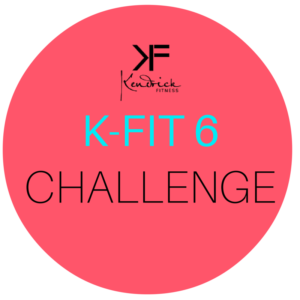 6 Week Online Weight Loss and Strength Training for Runners guided by Kendrick and his K-Fit 6 Team.